Regrun Reanimator is a free software for Windows to remove malware, spyware, adware, Trojans, etc from your PC. Other than letting you remove rootkits and other malicious files from your PC it also comes with useful options like registry protection, prevent auto-startup of useless programs, remove unwanted changes made to DLL files, restore default file extensions for executable files, backup system files, etc. It can also protect you against Explorer redirected problem and autorun.inf problem. What I liked the most about Regrun Reanimator is its unique reporting system. So, if you are having any trouble in removing spyware, malware, etc, you can create a report from this freeware and send it to its team. After analyzing your report, they will send a file to you. The file will include the steps to remove that virus, rootkit, etc. Getting started with this free spyware remover software is really easy. Just download it from the link provided at the end of this article. After installing, when you open Regrun Reanimator, it will first open its Control assistant. You can use its Control assistant module to quickly remove malware and other hidden system threats. It lets you fix security issues and remove malicious files step by step. It contains different tabs like Send Report, Virus Scan, etc. You can switch between these tabs to perform different security operations. 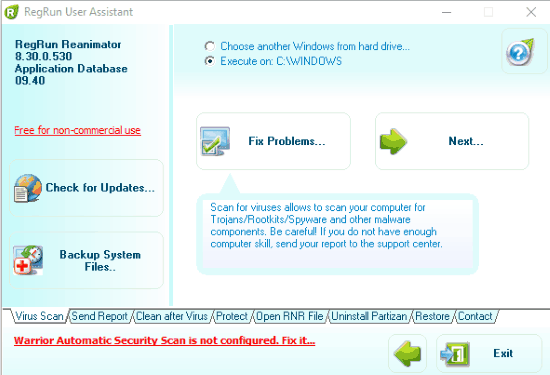 You can use it to fix browser redirecting, online anti-virus scan through Virustotal.com, scan Windows startup to remove hidden infected files, send detailed system report to Regrun Reanimator team to assist you in malware hunting, and scan for System drivers infected by rootkits. Virus Scan: This tab includes options to fix Browser Redirect problem, send an error report, online antivirus scan using Virustotal, remove hidden rootkits using Regrun Warrior CD, and scan for rootkits at Windows start-up. To perform any of these tasks, switch to Virus Scan tab and click on Fix problems. It will then pop up a dialog box from where you have to select an operation and then the task will be performed by Regrun Animator. Send Report: I have already mentioned about unique reporting system provided by Regrun Reanimator to its users. You can send a full auto-generated system report of your PC to Greatis Support team. The system report is basically a text file “regrunlog.txt”. After analyzing the system report, the team will send you an RNR file “RNR.RNR”. 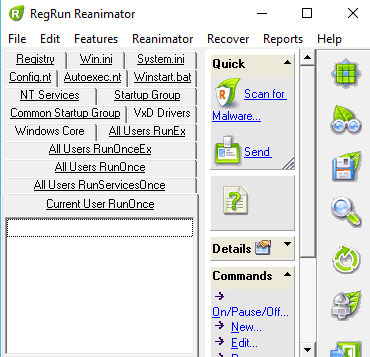 You can open this RNR file with Regrun Reanimator and execute the steps for removing viruses, spyware, etc from your PC. Step 1: Switch to Send Report tab and click on “Send Report” button. Step 2: A dialog box prompting you to generate a system report will appear on the screen. It is recommended to create a system report after the next reboot of your PC, so click on Reboot Now button to reboot your PC and generate a full system report. Step 3: In this step, a dialog box will appear to send the system report to Greatis Support team. After specifying your email address and problem, click on Upload button. Your problem will be reported to Greatis support team and you will receive an email that will include a Ticket number. You can use this ticket number to track the status of your problem. The team will send you an RNR file after analyzing the system report. You can open this RNR file with Regrun Animator and follow-up the steps included to remove spyware, adware, etc. Clean after virus: It lets you clean computer settings after a virus attack. You can use it to unlock system programs like File manager, Task manager, etc and repair “Access Denied” error on files. Protect: From this tab, you can guard your PC against Explorer Redirected DLL problem and autorun.inf problem. Open RNR file: From this tab you can open the RNR file sent to you by Greatis Support team. It contains the command to remove the hidden rootkits. Restore: This tab includes the options to restore files deleted by Regrun, recover file, and perform Windows System restore. Regrun Reanimator is a free adware, spyware remover, etc for Windows. I will surely recommend this software if you are looking for a powerful software to remove hidden rootkits, any type of malware, adware, spyware. Additionally, it also lets you backup system files, protect registry files, scan for viruses through Virustotal, enable/disable auto-startup programs, etc.